Who’s the best player in basketball right now? According to NBA 2K19, it’s LeBron James. Yes, hardly a shock. But what about the next 49? That’s more debatable, particularly with rookies Ben Simmons and Donovan Mitchell establishing themselves among the elite in 2018. Both of those guys are fun to play as in 2K19, but – as you’re about to discover – neither are rated numero uno at their respective positions. 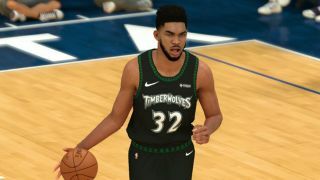 Below are the 10 best NBA 2K19 players at center, guard, and forward, as well as the top-rated free agents, just in case you’re mapping out initial franchise mode plans. Note that players are ranked according to their default in-game position: so while the 76ers will likely use Simmons at PG, for the purpose of this piece he’s still considered a PF. A stacked position with ten players rated 85 or above, and Clint Capela (Rockets) and Steven Adams (Thunder) narrowly missing out on this chart while still boasting strong 84 overalls apiece. Cousins’ Golden State Warriors are 2K19’s most highly-rated team on the back of their third NBA championship in four years, but he can’t quite edge out 2015-16 rookie of the year Towns for the ‘best center’ honour. Curry led the Warriors to their first NBA championship for three decades in 2014-15, then proved it was no fluke by claiming two more titles in three years – and scarily, he insists he’s only just reached his peak at the age of 30. 2K19 dev Visual Concepts evidently agrees. Elsewhere, Irving makes the Celtics a tantalising prospect in MyLeague (2K19’s franchise mode): aged 26, you’ll get another decade out of him, and even longer out of 20-year-old Jayson Tatum (SF, 87) and 21-year old Jaylen Brown (SG, 84). It’s always exciting to start MyLeague as a team who’ve just picked up a new star player, so expect many to go with San Antonio as their roster of choice this year. 29-year-old Derozan was acquired from the Raptors with three years still to run on his current deal, and steps into a line-up that also includes LaMarcus Aldridge (PF, 88) and DeJounte Murray (PG, 78). Only 2018 MVP Harden stands ahead of him in the pantheon of current shooting guards. No surprise to see who tops the list – LeBron is rated 18 overall points better than his closest team-mate, fellow small forward Brandon Ingram (82). Kyle Kuzma (PF, 80) is the only other Lakers player to pass the 80 mark. There’s a tough decision ahead if you fancy running that aforementioned Celtics franchise, with both veteran Gordon Hayward and hot prospect Jayson Tatum rated among the top seven. Just missing out is 2014 draft pick TJ Warren (Phoenix Suns), with an overall of 80. Much like center, power forward is a deep position across the NBA: three talented pros fall short of the above list despite being rated over 80: Jabari Parker (Bulls), Julius Randle (Pelicans), and Kyle Kuzma (Lakers). Even so there’s daylight between Davis and contemporaries Porzingis and Aldridge - hardly surprising given his status as a five-time NBA All-Star and 2012 Olympic Gold Medallist. Many expected Dwayne Wade to retire following his farewell season in Miami, but he rubbished those suggestions with a single two-word tweet in mid-August: “fake news”. Start a MyLeague and you can add him to your roster with a still-serviceable overall rating of 79. Jefferson and Lauvergne add depth at center, though your options are significantly more limited if you’re in the market for a back-up small forward: wily veteran Joe Johnson, most recently of Houston, is the only freebie ranked higher than 75. NBA 2K19 is out now on PS4, Xbox One, Nintendo Switch and PC. Prefer your American sports oval-shaped? Then be sure to check out GR’s review of EA rival Madden NFL 19.